Since the Wii came out, gamers have wanted to swing a lightsaber around like the Jedi and Sith, and while that happened, it wasn’t as great as it should have been. So the next step was to bring the powers of the Force to Kinect with Kinect Star Wars, but is the force strong enough or has Kinect turned to the Dark Side of gaming? 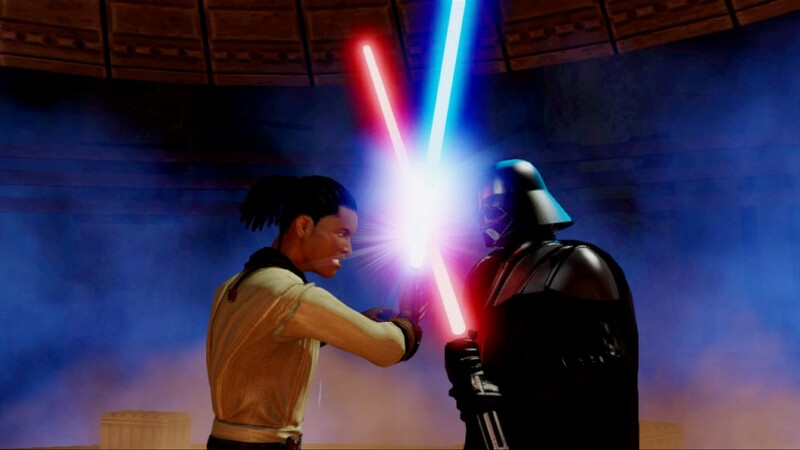 The game starts out in the old Jedi Archives, which serves as the main hub for selecting one of the 5 game modes. The main mode takes place in the Episode 1-2 timeline and lasts only about 2 hours, in which you’ll be on rails using the Force to take out droids and of course, duel with lightsabers. The problem with duelling is that it’s just handled so terribly, essentially you start on defence and block the attacks till a meter is filled, then you can try and bring down the enemy’s health for a few seconds before repeating the process. 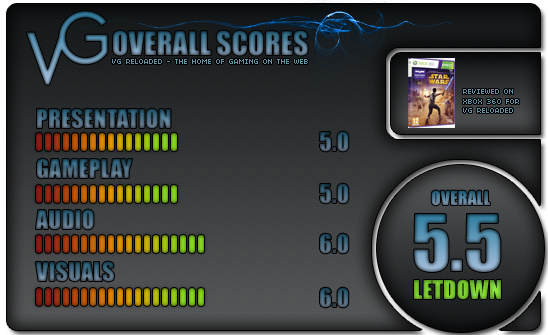 You can also kick at certain points, but sometimes Kinect just wouldn’t acknowledge that I did it when I was told to. Using the Force doesn’t feel rewarding and does very little to enemies, it’s only really worth using at key points to progress and those are rare. All in all, the main campaign is a real letdown while there’s a whole mode dedicated to lightsaber battles against some of the famous Star Wars enemies like Darth Maul, Count Dooku and of course, Vader. I was looking forward to how these would play out, but it’s the same deal as the campaign, except it’s more choreographed and dragged out. It’s just a real disappointment considering the lightsaber battles in Star Wars are some of the most memorable in film history, but it hasn’t translated well here, it’s not fun and it’s actually boring. Podracing returns and is perhaps the best of the modes, but that too only lasts a few hours. You essentially control the podracer like you would imagine and it’s quite accurate, yet it can be tiring after a while, yet it’s the most rewarding game out of the bunch. There’s also a shooting mode which isn’t too bad. Now for the elephant in the room, which is the dancing mode…it’s a complete rip-off of Dance Central, but even mixes up old songs and places Star Wars terminology into the lyrics, it’s cheesy as hell and will make any Star Wars fan cringe to see Han Solo dancing. The worst mode has to be Rancor Rampage, which gives you full control over a Rancor and the objective is pretty clear, destroy everything in sight. Kinect struggles to recognise your moves here and it’s just repetitive. In terms of performance, Kinect Star Wars is really rough around the edges with poor visuals that are inexcusable for a Star Wars game; even models of C-3PO and R2-D2 look terrible. Voice-acting is pretty bad too, and the music from the dancing mode is so cheesy it’s unreal, but the main music is classic of the franchise.